I guess my card yesterday with green hair on the image was just practice for the new challenge theme at Tuesday Throwdown this week, which is "Wild Colored Hair!" Our wonderful sponsor is The Paper Shelter and they provided an image for the team to use. You need to check out the Tuesday Throwdown blog to see all the different inspiration and colors of hair. The image is colored with ProMarkers and glitter gel ink. 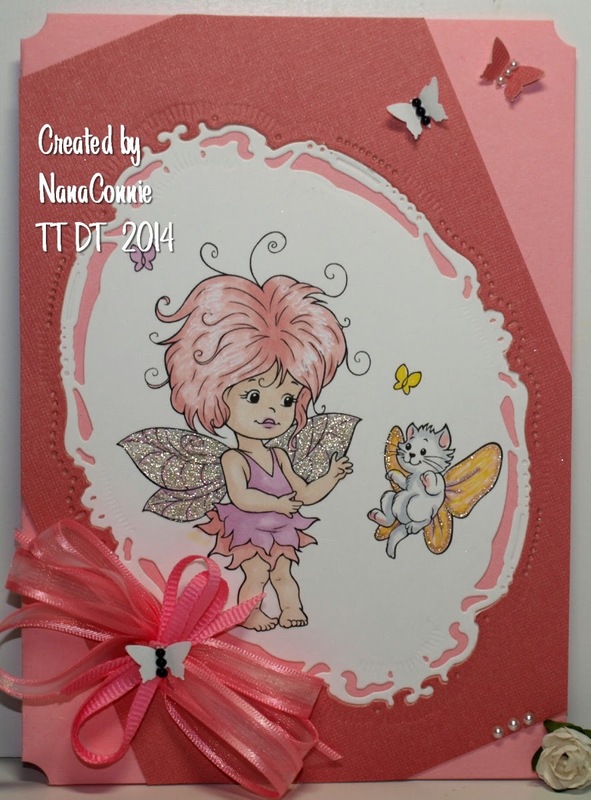 I used one of my framing dies to cut the image and then used the same die to cut a negative from dark pink CS. I used that to 'frame the frame.' It took a bit of planning because I wanted to have the image framed on an angle instead of vertical but I also wanted to angle the darker pink CS on the card base, which is a lighter pink. The butterflies are punched and I added pearls to the bodies, plus I added three pearls to the bottom corner. Speaking of corners, I used a punch on all four of them. The bow is made from two separate ribbons, one tied into a triple bow and the other into a double bow and then tied together with a butterfly in the middle. A week or so ago, I told you how much I dearly love the bears from QKR Stampede (challenge theme: dies or punches) and today I'm using another one for a Get Well card. I hope this brings a smile to your face. AAA Cards and it has to be CAS. I tried to stick with the colors, too, but dulled my background pink quite a bit. 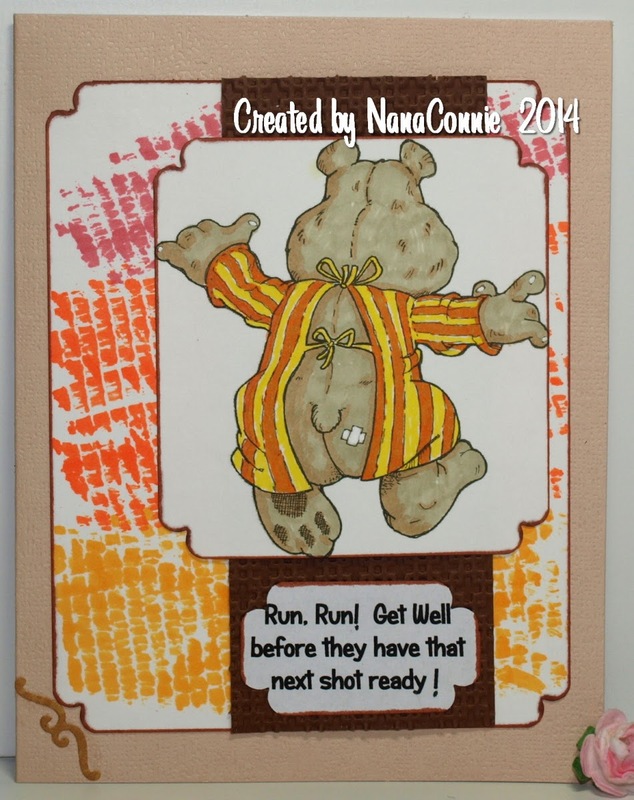 I colored the bear with ProMarkers, then die cut the image with a square die and used a corner punch on all 4 corners. The background piece I made myself, using an old piece of plastic netting (like you get with a fruit or vegetable bag) and coloring across it with the chisel tip of the ProMarkers. Aside from the fact that I wanted something close to the background on the CASE card, I really like that effect and will use it again, I'm sure. That piece is also die cut and punched. Papertake Weekly -- Ooh, so cute! I have the honor of being a GDT at Through the Craft Room Door this week, where the challenges are always "Anything Goes." 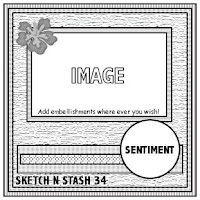 I got to use a digital image drawn by Sandi Huggett, one of my favorite artists. I first got to know Sandi and her work over at The Outlawz. Here's one of her incredible flower images. 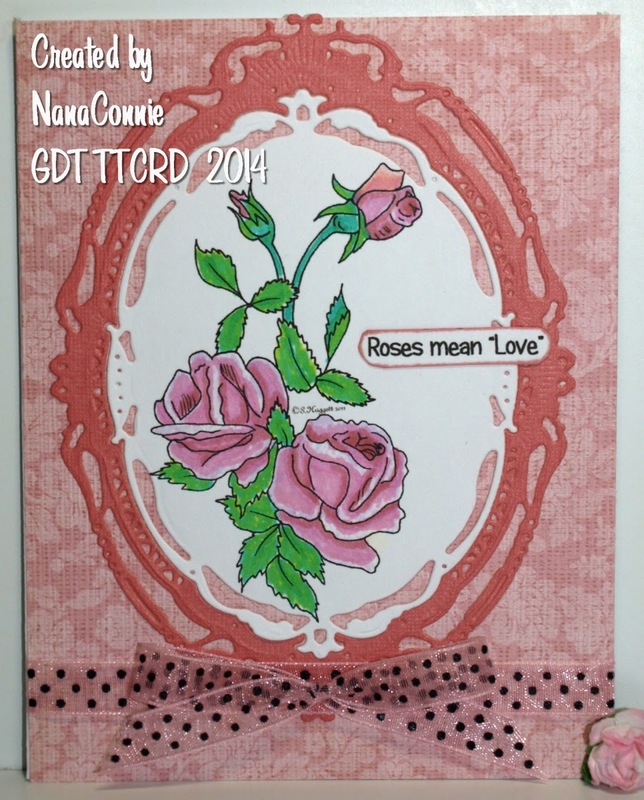 I colored the roses with my ProMarkers, then die cut it with one of those wonderful framing dies by Spellbinders. 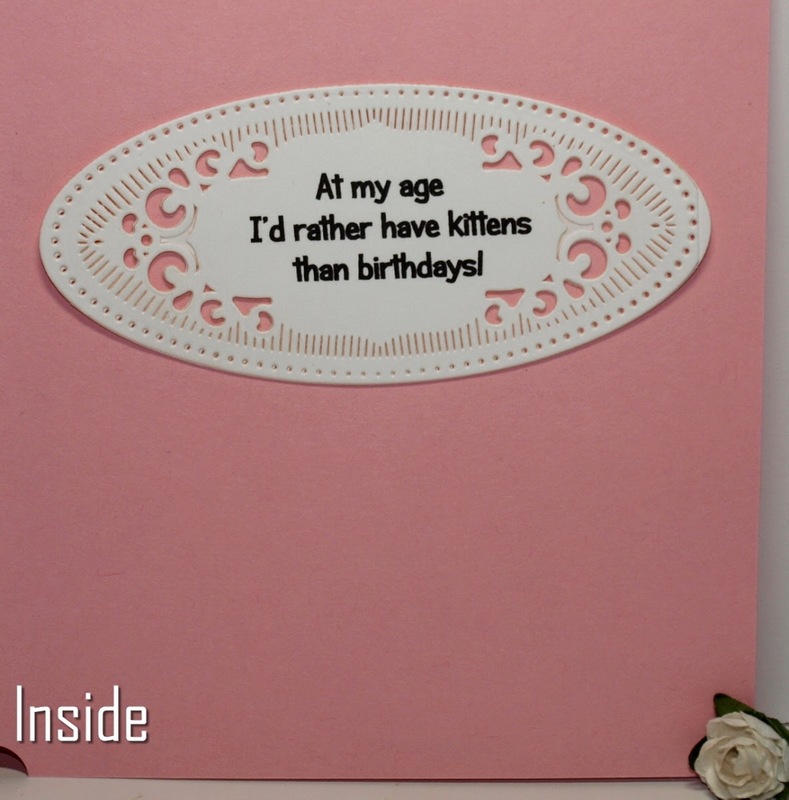 I cut another frame with the die one size larger, using some dusty pink CS, and embossing it. The dp is from Crafts, Etc., the "Sweet Pea" stack. The lovely, sheer, polka-dot ribbon came from Really Reasonable Ribbon and is one of my favorites. I wish I had more of it in my stash. The frames are so decorative and detailed that I decided to limit embellishment to just the ribbon. That way, the focus is on the gorgeous roses! Happy Mother's Day to all the moms in Canada and the US! I have to admit that my favorite silly bears are the ones from QKR Stampede. They're just so quirky and full of attitude. 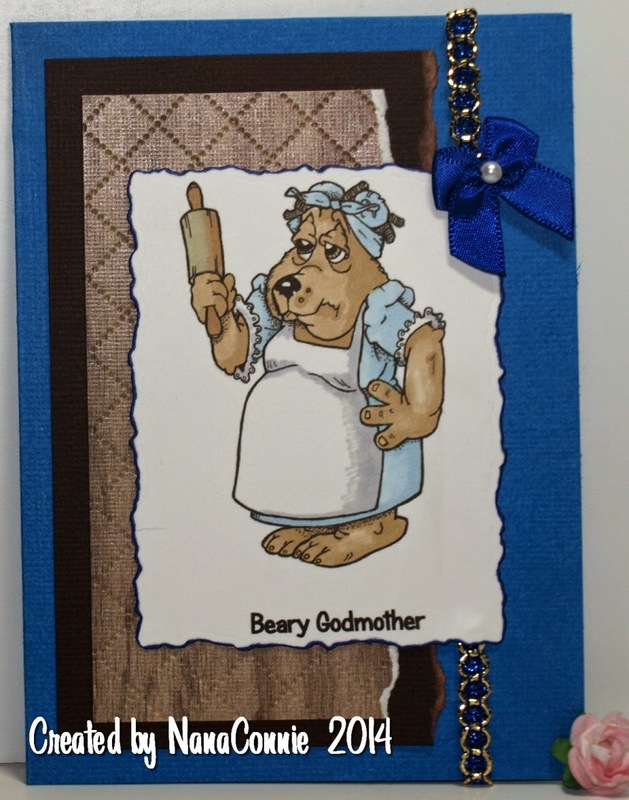 :-D Today I combined the "Baking" bear with one of the QKR sentiments about a "Beary Godmother" and I think this is such a fun and funny card! Here's the card front. I colored the image with ProMarkers and die cut it with one of my Spellbinders dies, then distressed it with one of the Ranger inks. The inside sentiment is cut with a die from QuicKutz. 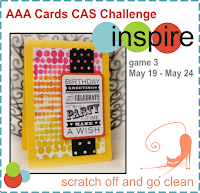 The A2 card base is made from colored CS. 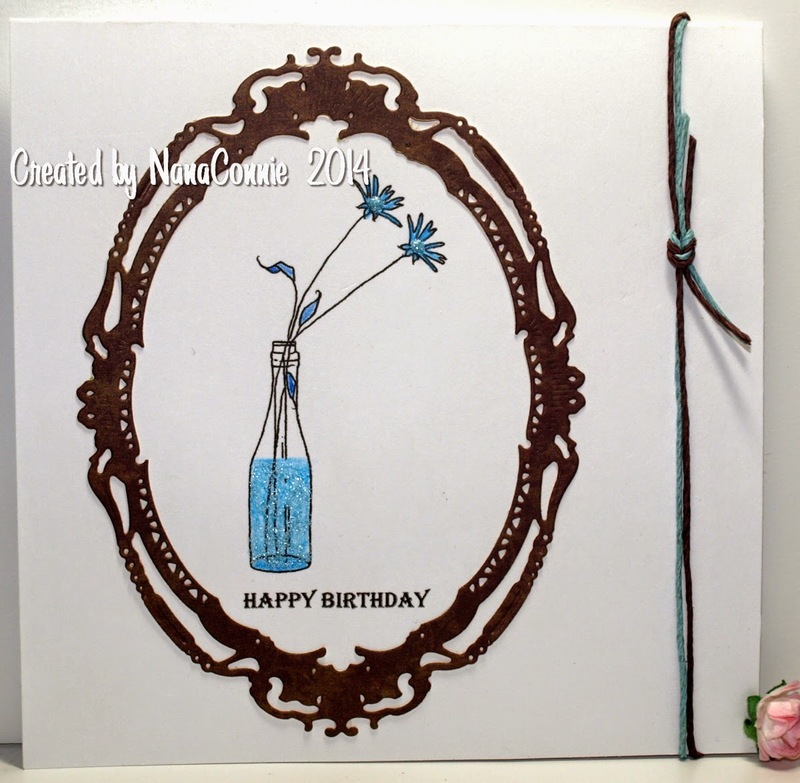 I used two pieces of scrap brown CS for neutral colored layers (wanting a monochromatic feel to the card), tearing each of them and embossing one. The blue gems are on ribbon and I wrapped them around the card front. The bow is one of the ones I make and stash away until they're needed. 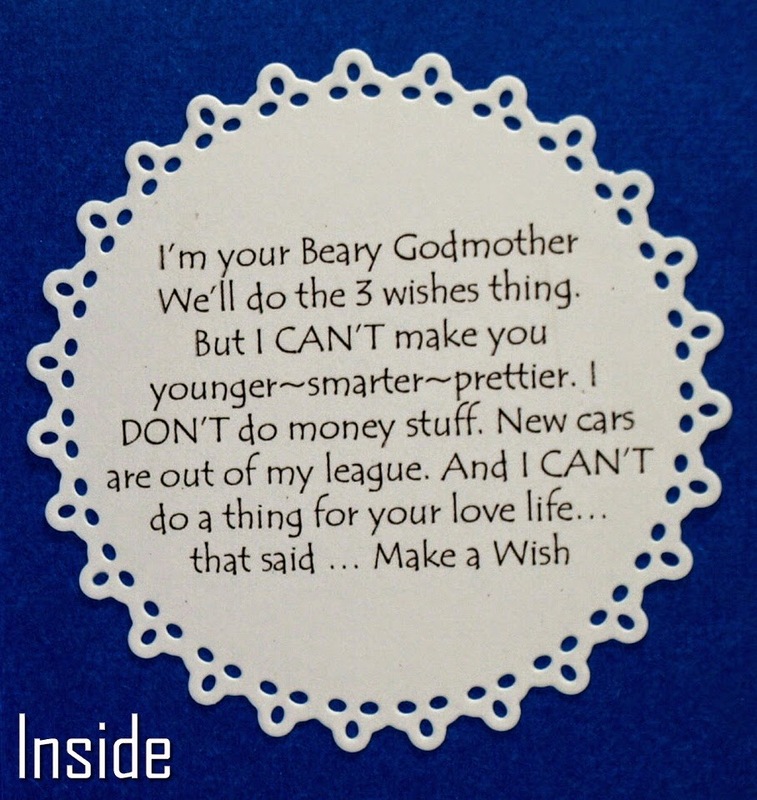 It's been a while since I used an image from A Day for Daisies (add a doily or twine) but when I saw this one while scrolling through my collection, I immediately printed it (which is a story in itself!) and turned it into a birthday card. I know I've been doing a lot of those recently but my birthday card stash was down to nil, zero, nada so it's time to make several and get stocked up again. but it's turned 1/4 turn. See below for the explanation on that.